Silvia Moreno-Garcia’s short story “Maquech” is a narrative of wealth disparity and the value attached to animal life. Set in the near future, rare animals that are going extinct have become commodities for the rich, purchased as fashion items, status signifiers, and indicators of wealth. Animals are not valued unless they serve a capitalist end, providing an economic advantage. In a world of wealth disparity, where the poor are struggling to survive, animals are endangered, seen as competitive resource consumers, and de-valued. Rather than balancing wealth and making clean water and food available to all (instead of just to the wealthy), the poor starve and live with thirst and come to see animals as only competition for resources rather than valuable contributors to the world around them. Rather than viewing the wealthy as the competing consumer, the cultural messages of this near future world construct animals as the competing organism, and a draw on resources, much as, in our own time period, the wealthy tend to blame others for the disparity in availability of resources. Mario is the grandson of a man who makes rare animals, reconstructing them before they are extinct. He wants to travel to Canada to see the polar bears before they become extinct and sells a rare maquech (an insect) to Gerardo in order to get the funds to witness animal life flourishing before it disappears. Gerardo sees the maquech as an economic advantage, a saleable item for the wealthy to consume since the rich use these live insects as clothing items, a living broach on their clothes. Animals have been reduced to trade items, methods for people to make money and survive in a competitive future. Ignoring the ecological and mythical significance of the animal, its life has been reduced to a dollar value. It is the very nature of extinction that attributes value to these animals, their rarity constructs them as something to be used as status symbols: “he likes real things and real things are scarce”. Life itself has been rendered as part of the capitalist economy, but the real wealth of animals, their deeper significance is lost in the trade for money as Gerardo discovers when he finds a loss in himself at the loss of his maquech. To find out more about Silvia Moreno-Garcia’s work, you can visit her website at http://silviamoreno-garcia.com/blog/ . 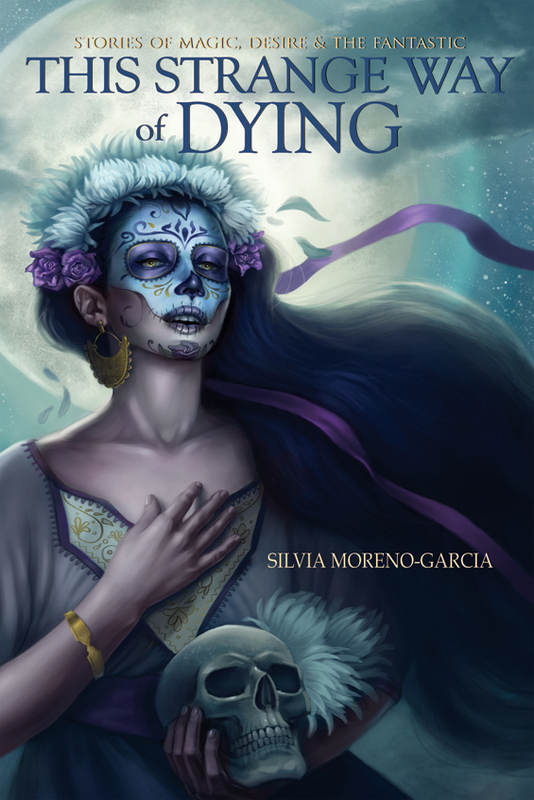 To read this story and others from This Strange Way of Dying, you can explore it at http://silviamoreno-garcia.com/blog/this-strange-way-of-dying/ . This collection will be available in the fall. This entry was posted in Fiction Book Reviews and tagged animal, capitalism, commodification, competition, consumption, extinction, insect, near-future fiction, poverty, Silvia Moreno-Garcia, status, water, wealth, wealth-disparity. Reminds me of a Derryl Murphy story — I think it was in Wasps at the Speed of Sound, about a media scrum around the death of the last … was it a Komodo Dragon? I haven’t read this one of Derryl Murphy’s stories. I will definitely have to check it out.